This time last year I was lucky enough to be introduced to the COOLA range of suncare, and spent the rest of the summer recommending it to all and sundry! A beautifully packaged collection of organic sun essentials produced out of Southern California, the COOLA range includes a plethora of yummy products that are high performance yet delicate and luxurious enough to compliment any skincare regimen - no matter how fussy, and even after cosmetic procedures – and are kind on the environment. It is produced in limited quantity batches in California (where the company is based), meaning that the range can be reformulated often, taking advantage of new developments in sun science and labelling regulations almost as they happen. 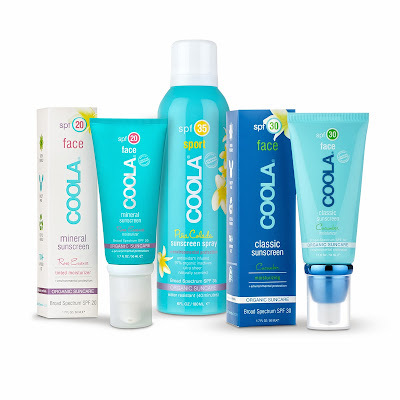 I especially love the fact that the COOLA range has three distinct organic sunscreen collections to choose from: Plant UV, Mineral, and Classic, each based on different active ingredients. The Classic Sunscreens use organic active ingredients (commonly referred to as “chemicals”), while the Mineral Sunscreens use mineral (“physical”) active ingredients like Titanium Dioxide and Zinc Oxide to scatter and reflect UVA/UVB rays. The mineral sunscreens are effective right after application, making them perfect for the whole family. The Plant UV collection protects the skin with naturally protective plant cells that contain antioxidant and anti-inflammatory properties. All are blended into luxurious, moisturising bases which make up about 90 per cent of the product, and 70 per cent of this includes certified organic ingredients. Anyway, I was also lucky enough to be given three COOLA prize packs to give away, valued at $155. In each you’ll find COOLA Mineral Face SPF20 Rose Essence Tint, COOLA Sports Spray SPF30 Piña Colada and COOLA Classic Face SPF30 Cucumber - a great way to kick off the sunny months if ever there was one. To enter email helene@mshelene.com with your name and physical address, and pop over to the COOLA Facebook page and hit a big LIKE! Awesome - thanks for the chance! Ah, thanks for the chance to win this awesome prize! !